A man has been jailed for six years after repeatedly hitting a bottle over a woman's head after she smiled at him. 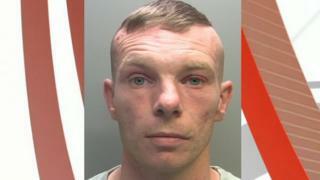 Liam McGrath struck the woman several times in the unprovoked attack at the Outrageous club in Carlisle during a night out in August. McGrath, 36, of Greenmill Road in Longtown, admitted wounding with intent when he appeared at Carlisle Crown Court. The victim has been scarred for life, the court heard. The hearing was told McGrath was so drunk at the time of the attack, which left his victim with two significant wounds to her forehead, he could not remember it. Recorder Jeremy Lasker told McGrath: "You should be ashamed of what you have done to that lady." The court heard the victim smiled at McGrath just moments before he launched the attack at 02:00 BST. One witness said McGrath drew his arm back to get more power in his blows. Another onlooker reported he appeared to hit the woman "as hard as he could". The court was told McGrath had previous convictions for assaults on women. Kim Whittlestone, defending, said: "He is at a loss to know why he reacted in the way that he did. "He sends his apologies to the complainant."